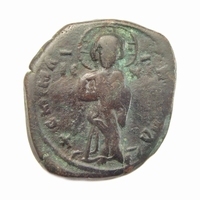 Byzantine bronze lid from a seal box, depicting three figures. 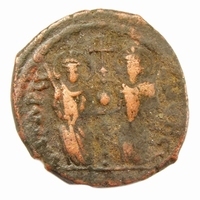 A standing man holding long cross, a woman and child at his side, the couple is possibly Emperor Justinian I and his wife Empress Theodora. Greek legend around, two loops at the edge. 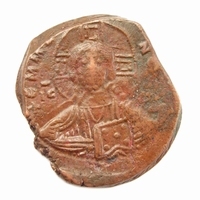 Green patina, encrustation on the back.